Directions for making a cutting frame are nicely described by Bill Ooms. Bill has done a great job outlining how to make a number of different cutting (and drilling) frames. I'm not a machinst and I don't have a milling machine, none-the-less I followed Bill's directions as best I could. This page outlines some notes and lessons learnt from building and using my first cutting frame (a UCF) and second cutting frame (a HCF). It also outlines changes I am making in my next one. The various parts in the picture to the right are labelled for helping to outline what is discussed. If this is your first cutting frame you are making, I recommend making a horizontal cutting frame (HCF). Horizontal cutting is what I have done for all the pieces I've made to date, and there is a great need to ensure the cutter cuts exactly in a horizontal plane for a number of cuts (e.g., ribs along a shaft like on a shaving brush). I used a bar of aluminum for this, and that worked acceptably; but I used steel in my 2d generation version to further minimize vibration at the cutter head. Interestingly, I've noted that Bill Ooms also made his 3d and 4th generation ones from steel. Notes for Next Generation: I am considering making a single piece on a milling machine which functionally includes these parts. I am also looking to make this piece from steel. I made mine using aluminum, and used skate board ball bearings. Boring the Belt Guide Pulley so that it had a press fit onto the bearing was incredibly difficult. If it was too tight, the bearing was constricted and did not spin easily. If it was not tight enough, no amount of Loctite would keep the two joined together (and I tried both red and blue). The pulley slid off the bearing too often. The 1/4 inch bolt used as the Retaining Screw and shaft for the bearings was not sufficiently big enough in diameter. The pulleys would rub against the attachment shank, belt guide pulley attachment block, and the upper cutter head extension arm. Using aluminium for the Belt Guide Pulley Attachment Block did not provide a sufficient base for reasonable wear-and-tear. The screws worked loose, and had to be retightened often. This could easily have been from all the vibration incurred by the parts which weren't well secured. Skate board ball bearings worked acceptably, and are very cost effective (30 for about $12). A Bearing Grommet was turned to fit tightly into the bearing. 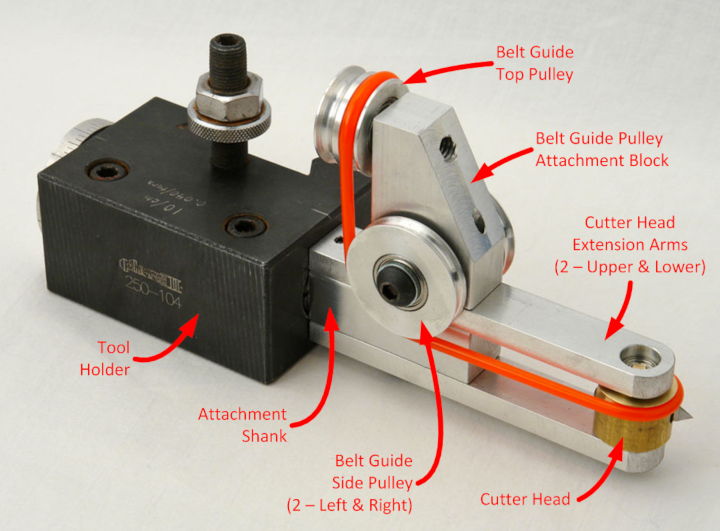 This is to minimize side-to-side movement of the belt guide pulley. The bearing grommet has a flange which abuts against the bearing's center. The flange's thickness is around 1/16 inch to hold the belt guide pulley out from the belt guide pulley attachment block. The grommet fits tightly into the bearing's center, and extends just short of the complete width of the bearing. The grommet has a hole thru it which accommodates the retaining screw. I am using a #10-24 screw. A Bearing Retaining Washer was turned to secure the bearing. It abuts against the bearing's center. Its thickness is around 1/16 inch. 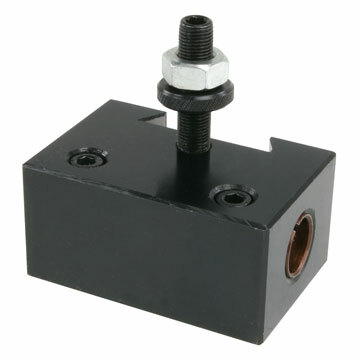 It has a hole thru it which accommodates the retaining screw. I am using a #10-24 screw. A Bearing Retaining Set Screw was added to to secure the bearing to the belt guide pulley. This is to accommodate the difficult of boring the belt guide pulley for a press fit onto the bearing. A #8-32 set screw was used, and works well. Note : A Belt Guide Top Pulley is not needed when making a Horizontal Cutting Frame. The cable from the overhead drive is routed through the Belt Guide Side Pulleys and around the Cutter Head. 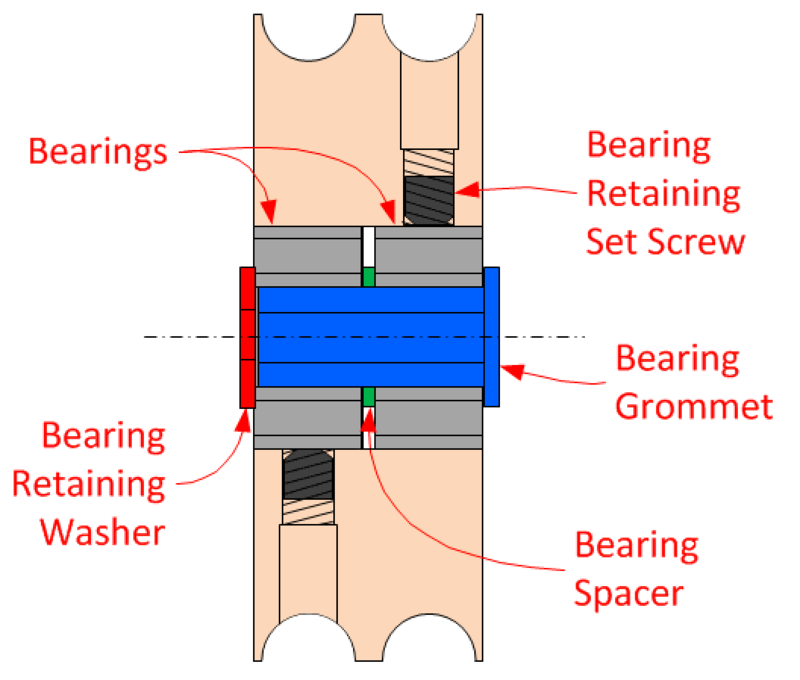 Two bearings are used (gray parts in the picture to the right). The Bearing Grommet has to be longer (blue part in the picture to the right). A Spacer was turned to separate the bearings so that the bearings are flush with both sides of the pulley (green part in the picture to the right). The spacer abuts against both bearings' centers. Its thickness is around 3/32 to 1/8 inches. It has a hole thru it which accommodates the bearing grommet. A second Bearing Retaining Set Screw was added. This one was put in at 180° from the first one. I used a block of aluminum for this, and that worked acceptably, but I did find that the screws used as axles for the belt guide pulleys worked loose and had to be retightened often. When I build a replacement UCF, I will be using a block of steel to enable better screw holding. Notes for Next Generation: I am considering making a single piece on a milling machine which includes these parts. Bill made his from brass, but I used cold rolled steel. Mine doesn't look as nice as I don't have the contrasting colour of the brass against the aluminium. But it works fine. The shaft on the cutter head was increased from 1/8 inch to 1/4 inch. This was to give it more resilience as the first on wore out too fast. 3/16 (0.1875) inch thru hole drilled in the cutter head to hold the cutter. 2 set screws used to retain the cutter. The set screws were put in 180° apart, and 90° offset from the thru hole for the cutter. The set screws used are 1/4-20. The hole drilled for tapping was done using a #7 drill, giving 70% coverage. This was done to minimize the chance of the set screws loosening. 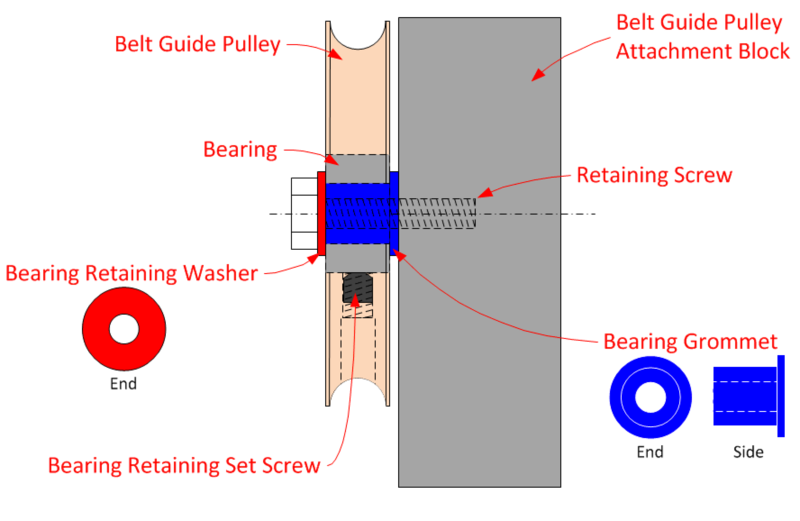 If the set screw(s) become loose, either the set screw(s) or the cutter would become a very dangerous projectile. Use a #12 (0.1890) drill for the cutter insertion thru hole. The larger size is to make changing the cutter easier. Using #10-24 set screws. The hole drilled for tapping was done using a #25 drill, giving about 75% coverage. Some turners prefer a 1/8 inch rod for the cutters. If you choose that route, consider drilling a #30 (0.1285) thru hole to make changing the cutter easier. I used a bar of aluminum for this, and that worked acceptably. And this is what I'm using in my 2d generation version. But I've noted that Bill Ooms made his 3d and 4th generation ones from steel to further minimize vibration at the cutter head. 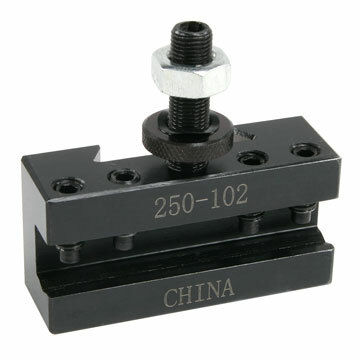 For a horizontal cutting frame (HCF) or vertical cutting frame (VCF), use a quick change tool holder. For a universal cutting frame (UCF), use a boring tool holder.